LOVE your blog, thank you for all your hard work!! I’m excited to see that Audible is getting more mention on your site & I thought add my 2 cents. The short, I Love Audible and Whispersync is the best invention ever!! Now I can listen to my books while doing yard /house work and when it’s finally time to sit down and relax I can pick back up reading my book! I get so much more done these days!! Here’s a secret…shhh don’t tell everyone. (jk,lol) Audible has a Membership plan called “Inactive Light”. It’s $9.95 a year! With this plan I have full access to Audible & also receive their membership discounts but don’t have to deal with the credits!! With this plan I don’t have to worry about credits expiring, price shopping books or canceling/starting my subscription to fit my needs. It’s just always there & super easy; perfect for the yo-yo listener like me! Audible doesn’t advertise this “Inactive Light” option with the other membership options, you have to dig for it on their website or to call and ask for it. Most of my Audible purchases are what I like to call a “combo purchase” which is buying the kindle book and adding Audible audio for a reduced price (mostly $1.99 – $5.99) which works absolutely perfect for me because I LOVE to do both! So in my travels of the Audible experience I have come across the following which I LOVED and would like to share as my Audible Favorites and also learned a few things. 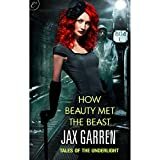 How Beauty Met the Beast: Book One of Tales of the Underlight (Trilogy) by Jax Garren narrated by Therese Plummer. Great story; dystopian feel. The Beast: Scarred. Damaged. Living with a terrible secret. Agent of the Underlight Wesley “Hauk” Haukon has nothing left but the fight for liberty against the oppressive Order of Ananke. He’s starting to lose hope…and then he sees her. The Beauty: Despite her night job as a burlesque dancer, grad student Jolie Benoit has always played the mostly good girl. That all changes following a scorching sexual encounter with a stranger whose face she doesn’t see. Here’s a great example: Audible purchase alone for one book is $15.99. But if you “combo purchase” buy the Kindle version for $1.49 & add audio for $2.99 and you get both versions for under $5 each! 600 Hours of Edward by Craig Lancaster <— Audible also has a Daily Deal; this is how I came across 600 Hours of Edward by Craig Lancaster. This was a HUGE pleasant surprise and the narrator Luke Daniels is fabulous! (Though his girl voice is kind of funny and takes some getting used to, but his man voice is outstanding and makes up for it!) I was tickled there was a book 2, Edward Adrift to finish up the story. This is a great underdog/recluse story; I was glued! Edward is a 39 yr. old with Asperger’s and obsessive-compulsive disorder. His carefully constructed routine gets turned on its ear when a single mother moves in across the street… This is now a Kindle Unlimited book with narration!! So if you’re a Kindle Unlimited member like me, definitely check this out! If not, combo purchase for K$3.99/A$1.99. JD Nixon: Heller series & Little Town series. Using Matchbook* or what the Kindle App calls Audio upgrades* I have collected both of these on audio for $1.99 each. These are great to have on hand for a refresher when the new books are released (it’s taking forever!) or for when I just need a Heller or Finn fix. Temptation: Under Mr. Nolan’s Bed, Volume 1 by Selena Kitt <— Under Mr. Nolan’s Bed trilogy by Selena Kitt narrated by Holly Hackett was one of my first Audible book experiences. :O It definitely got me hooked on audio books! (This was another Audible Daily Deal purchase back in the day.) Now an Unlimited Kindle book and add audio or Combo for K.99/A1.99. *What I’ve learned about Matchbook, Whispersync & Audio upgrades. Not all books are available in audio. Sometimes an audio book is available but won’t show up in Audio upgrade/Matchbook. Also not all he books that are available in both formats are Whispersync eligible, meaning it won’t automatically update your current location in both formats and you have to do it manually. Prices and upgrade availability does change so the prices/availability I have included today could change at any point. I think I will end this here. I hope this is helpful & happy reading/listening!! P.S. man Maryse, this really takes some time to compile. I now have a new respect for what you do for us! THANK YOU!!!! Fabi: Danette that’s a wonderful explanation and great recommendations. Thank you. I remember a few years ago it was the whispersync feature that convinced me to switch from Nook to Kindle. My place in the book automatically updates no matter if I pull it up on my phone, computer, iPad or Audible. It’s amazing. I’m currently doing the Night Huntress series from Janiene Frost, they are some of my favourite narration, $2.99-$3.99 if you have the ebooks. Also the Rock Chick series By Kristin Ashley are all $1.99 add-ons and are brilliant!! Inactive Light is a great idea for most, thanks!! I love to listen to a lot of YA fantasy, which is mostly traditionally published and higher priced – therefore I still need those credits.